I am coming down with the flu so what better way to play classic Amiga games on this Saturday afternoon. Besides that I read that there are some new updates available on AmiUpdate and also on OS4Depot. This is going to be a great fun filling Saturday afternoon. 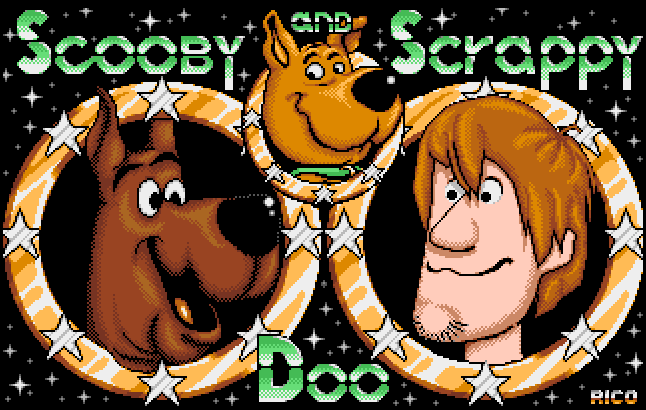 I decided to give Scooby Doo And Scrappy Doo a try today amongst many others of course. It can be difficult to find a game to play. I am trying to remember the ones I played when I was young and left a good impression. Plenty to pick from and surelenough to get me going this afternoon. Time to run AmiUpdate and the latest updates installed on my Amiga. There are 4 new updates which installed without any problems. This is a great way to get the latest updates installed on your Amiga. I said it before already but OS4.1 Update 6 is running really stable on my A1SE. Sure I got my odd freezes and crashes but that is due to the A1SE. But besides that it is a big improvement. You can say what you want about the A1SE, it still runs after all those years. I wonder if you can find out more info on the updates that are being installed. For example what will be fixed or introduced in this new intuition.library update. 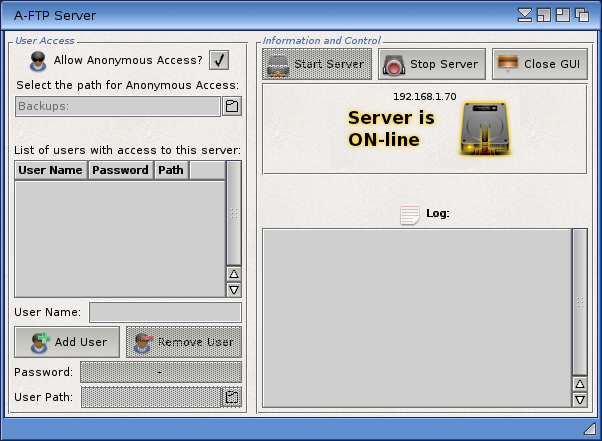 A new version of A-FTP Server was released today. Of course I installed it right away. This is really one of my favourite utilities. It still allows me to transfer files between my Amiga and laptop. A very happy man here! Besides playing games I have to of course fire up some good old Amiga demos. I am giving all 3 Music Invasion discs from The Jungle Command a try. What a blast from the past. Saturday evening here and that was a great afternoon. Time to grab some dinner and watch some great movies. Still left to do for this weekend is some programming on the Amiga. Sounds like a great weekend doesn’t? Tuesday evening and I am actually spending some time with my Amiga A1SE and starting with this column already. It has been a long time that I actually fired up the Amiga A1SE during the week. I do believe I had it on during the week last year when I was installing OS4.1 but before that must be ages ago. It feels really good and I am trying to do this more often. 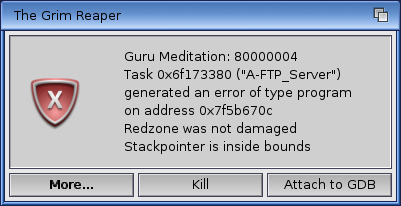 Suddenly yesterday A-FTP server stopped working. When I start it I get a Grim Reaper message. From what I can remember the only thing that changed is that I used AmiUpdate to update MUI GUI toolkit and realtime.library. And I manually copied the latest SDL library to the correct folder since AmiUpdate was unable to perform the installation. I had some USB lines in the kicklayout file that I had enabled again so at first I thought this is what is causing it. But after disabling them again it still gave me the same error. I even downloaded the latest version of A-FTP server but also that version gives me the same error. At the moment I have no idea how to resolve this. I am really sad about since I really loved the way A-FTP Server worked. I will run Snoopy to see if I might be able to locate the problem. I also just posted on AmigaWorld to see if others might be able to help. Friday evening and somehow I found out a bit more about the issue I have with A-FTP. For whatever reason I decided to start Jack to see if that had the same problem since it was also programmed in Hollywood and it indeed had. So it is Hollywood related. Still not found a solution but I have a bit more time now to loo into this. Sunday morning and I got it sorted. I checked the Grim Reaper info and I found out that svgimage.hwp was causing this. This is located in the Hollywood folder in LIBS. I downloaded the plugin that contains this file and removed the current one and copied that one to the Hollywood folder and I was up and running again. One thing I really overlooked is that once a program crashes and the Grim Reaper shows it will not bring down the whole system. Before with these messages it was game over. Maybe not right away but as soon as you clicked something it was bye bye. Big improvement in OS4.1 Update 6 and really happy about this. Time to wrap it up for this week’s column. Looking back on this week I am happy with the amount of time I was able to dedicate on my Amiga stuff. I am certainly going to keep this up as I should. If you read one of my previous columns (Designated boot sources) you know I was stuck with getting my OS4.1 installation to work from the SIL card. That has been fixed now. I moved the SIL card to a different PCI slot and it started to boot OS4.1 again. At the time I also moved it to a different PCI slot without any effect. I am sure I did. Anyway it is up and running again which made me really happy. First up was Update 5 that needed to be installed. The installation went really smooth but after restarting the Workbench screen was frozen with the mouse pointer stuck in the left top corner. I quickly remembered the Kicklayout file in the Kickstart folder which probably was replaced and the USB modules are being loaded again. That was indeed the case and after booting from the OS4.1 installation disc and commenting them out it worked again. Next up was Update 6 and after this was installed I changed the Kicklayout file (which was also replaced again) before restarting OS4.1 so it will work right away. 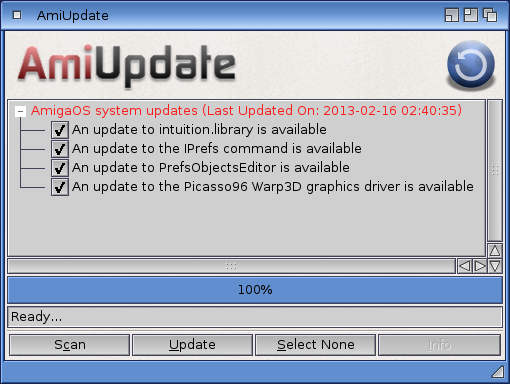 New in Update 6 is AmiUpdate. Well not new since it has been around for some time but new in the sense that from now on it is the preferred mechanism for the distribution of OS updates. After starting it I was greeted with a login screen. To login you can use the login details that you use for the Hyperion site to access the OS4.1 updates. After scanning for updates I was presented with some new system updates which I installed. So back up and running with the latest updates installed. I missed it. There you have it. After not playing with OS4.1 for some time and using it again I can’t express enough how much I missed it. Even when running it on my A1SE which is more unstable then a junkie at a crystal meth lab. What’s next? I am going to do some programming again and install some new stuff that has been released in the last couple of weeks if not months. You will be reading about it here at the Bucket Diary. It has been a while since I posted a new column. Busy times but yet I managed to use my A1SE a bit. Your’s truly had, and still has, the great pleasure of beta testing AmiSystemRestore from Chris Handley. AmiSystemRestore will allow you to nearly undo any changes to the SYS: partition. Compare it to the Windows restore function. At first I ran in to some problems getting it started (error message) but Chris provided me with an updated version that works. To test it I used AmiUpdate from Simon Archer. AmiSystemRestore detects I am going to update and will do it’s job as you can see from the screenshots below. Of course I will do some more testing and leaving it running in the background for longer periods of time while I run other applications. But so far I am impressed by it. Run almost any HD installed 68k game (or program) inside E-UAE, by simply double-clicking on it! Including WHDLoad & JOTD JST installed games. Run ADF & DMS games by double-clicking them. (Needs a little bit of manual set-up if you don’t have at least OS4.1 Update 1.) Otherwise just drag & drop them onto RunInUAE’s icon in AmiDock or it’s AppIcon. The installer can set-up E-UAE with full-speed Sam-optimised settings. But it can also use your existing E-UAE settings if you want. 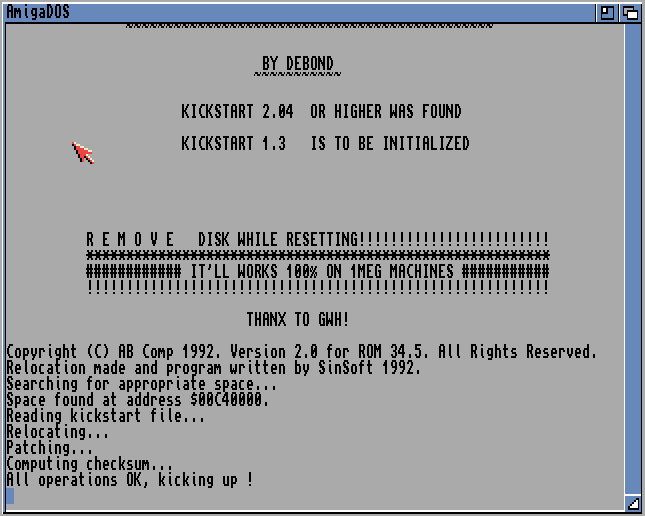 The installer will copy the necessary Kickstart ROMs off an Amiga Forever CD, if you don’t already have them installed. This week ACube Systems revealed their AmigaOne 500. It retails for about a 1000 Euro which is somewhat on the expensive side. Over at OldSchoolGameBlog you care read some more about this. You can say what you want about it (the price tag for example) but the fact remains that there is hardware being released and development going on. As always there is fair comment and the always slashing of any Amiga news on the forums. I guess that (slashing of any Amiga news) is probably the main reason I don’t visit the forums so much any more and just get my news from Amiga blogs and just check the RSS news feeds I subscribe too. It is strange that you got a group of people complaining there is nothing new coming out and once there is new stuff coming out it is rubbish. It does seem that group is getting the overhand in getting as much postings on forums. Again, I am not referring to the fair comments being posted but just the intention of posting nothing but negative stuff on forums. It will not prevent me from enjoying my Amiga experience but it is very annoying to see. Talking about Amiga experience; I am off to play with my A1SE.